Ancient artefacts can lead to rich rewards in Age of Egypt, a 5 reel, 20 payline video slot from Playtech. This trip back in time comes with a pair of features. There’s a classic pick me round as well as free spins complete with a 3x multiplier. Play on all devices from between 20p and £1,000 per spin. There’s nothing too flashy about the design of Age of Egypt – it’s all rather tastefully done though. The sand-swept desert forms the backdrop to the reels which feature lower value A to 10 playing cards and Egyptian hieroglyphs. You’ll see the scarab beetle, the bird god Horus and the all-seeing eye of Ra spinning around the reels. Land 5 of the latter on 1 of the 20 paylines and you’ll pocket a 500-coin payout. Helping to create winning combinations is the Tutankhamun-style burial mask which is the wild. It offers awards of 10, 200, 2,000 or 10,000 coins if you land 2, 3, 4 or 5 on a line. It replaces everything bar the scatter and bonus, both of which are key to unlocking a bonus feature. Anubis Bonus feature – land 3 or more of the dog god Anubis on the same payline on consecutive reels from the leftmost reel to trigger this variation of the pick me round. You’ll then be taken to the Tomb of Anubis and offered a selection of objects, behind which lie cash awards. The number of picks is equal to the number of bonus symbols from the triggering spin. Royal Treasury Free Games feature – the second feature is triggered by landing 3 or more of the Cleopatra scatter anywhere on the same spin. In addition to a prize of 5, 50 or 500 times your total stake, you’ll also receive 10 free spins. A 3x multiplier is applied to all winning free spins here, trebling the payout. Land 3 or more scatters and you’ll get another round of free spins – there’s no limit to how many free spins can be won. You can also hit the Anubis Bonus feature from within the free spins round too for even more wins. Age of Egypt is a very solid all-round performer. We’ve seen pick me rounds and free spins in many, many video slots. The 3x multiplier is a tidy addition though. Visually, it’s well done without being of the truly highest class. You couldn’t describe anything as being bad here. The design and gameplay are both perfectly fine – it’s just not that original. 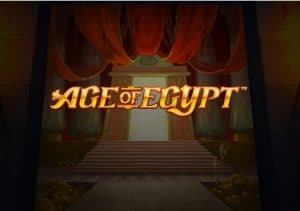 If you’re after a very traditional video slot in one of the online casino world’s most popular genres then Age of Egypt should leave you satisfied. Alternatively, Leprechaun Goes Egypt by Play ‘N Go is a superb choice.